As mothers, it is our destiny to face tragedy or crisis of some kind. There is no rule book that says mothers must outlive their children, or that a young mother will not lose a spouse in the early years of a marriage. There is no law that declares that motherhood is a bed of roses – in fact, where there are roses, there must be thorns. Along with the sweet comes the salty, the sour or the bitter. While we would love to avoid crises and tragedies, that is not our lot. The rain falls on the just and the unjust. Just because we moms birthed a watermelon-sized human, enduring all the pain, discomfort and humiliation that often accompanies giving birth, it doesn’t exempt us from worrying, agonizing, and grieving over our children when things go wrong throughout our motherhood journey. In fact, I believe it guarantees that we will experience great anguish as we walk with our children through times of great trial. The purpose of this book is to introduce you to several women whose stories, although brief, are more than a simple footnote in the pages of Bible history. In addition to the stories from matriarchs of old, you will hear three tales from mothers of modern times including myself, sharing our stories of tragedy, crisis, grief, and recovery. 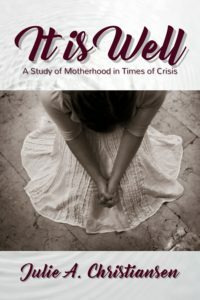 It is Well is slated for a May 2019 release. If you’d like to be one of the first to get your copy, you can pre-order by visiting our STORE , and as soon as the books come in from the publisher, a personally autographed copy will be shipped to you.